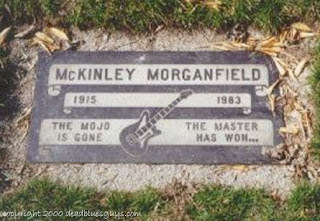 McKinley Morganfield, better known as Muddy Waters, died on this day in 1983. Known as the father of Chicago blues, he´s famous for his electric output, but I´ve got a personal weakness for his early, acoustic stuff. In 1941 and ´42, Alan Lomax recorded young Muddy for the Library of Congress on the Mississippi plantation where he lived from the age of 3 until he was 28, when he finally took off for the windy city up north. In these recordings, Muddy is still highly influenced by Robert Johnson, although he never heard him play. He was shown the essentials of Johnson´s style by fellow bluesman Son House. And in case you´re wondering how McKinley´s nickname came about, here´s the man himself: "We had a li´l shack and there was a creek - Deer Creek - come right up to the steps at the back porch. I was always playin´ in the creek and gettin´ dirty and my sisters called me Muddy Waters then." As simple as that. All this talk about the mid to late seventies Cleveland scene - and the great Pere Ubu in particular - on the inspiring Siblingshot on the Bleachers blog made me think of another Ohio scene: the Akron one. Known as the rubber capital of the world, Akron was famous for its local sphere of musical activity for a short while when the mighty Stiff label released a showcase called The Akron Compilation in 1978. 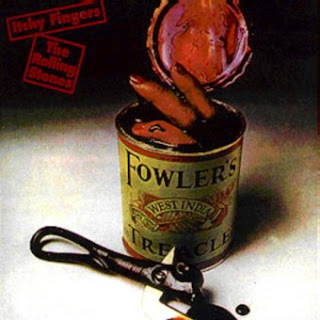 The album cover featured a scratch & sniff rubber tyre in the right-hand corner, and believe it or not, three decades later my copy still smells faintly of rubber when I rub a fingernail over it. None of the featured artists really managed to hit the big time later on, and as far as I know Akron never produced any band of note since. 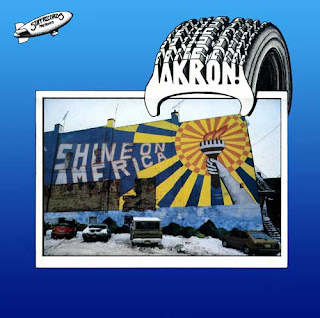 But The Akron Compilation still stands as a worthy testimony of what once was, and definitely deserves a cd release. Just check out the following gems by Rachel Sweet (a great singer), Tin Huey (Ubu-inspired weirdness), Jane Aire & The Belvederes (nice pop, complete with a searching-the-radio-waves intro) and the Waitresses (funky!) for proof. For the best soul instrumentals money can buy, most people turn to Booker T & the MG´s, Junior Walker & the All Stars or the Meters, and with good reason. But have you tried the Mar-Keys yet? 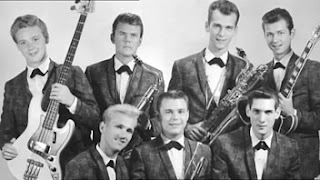 They were the famous Stax label´s first house band, featuring such giants as Steve Cropper and Donald ´Duck´ Dunn (who´d later both join the MG´s) and future Memphis Horn Wayne Jackson. Now go do the Pop-Eye Stroll, y´all. These are unfinished working versions of course, and it´s easy too see why they didn´t make the final cut in this form. Which doesn´t mean they´re not fun though. Made me wonder why the Stones haven´t released their own take on a Genuine Bootleg Series/Archives yet. There must be tons of great stuff in the vaults. You can make money that way Mick! Easy money. You know, dinero. Anyone got a clue why this didn´t happen yet? Please leave a comment. I´m just plain curious. 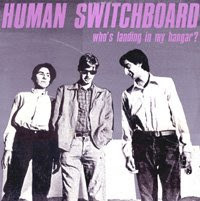 A recent thought-provoking post by Paul over at Setting The Woods On Fire, where he asked himself and his readers what would be the world´s most underrated rock band, immediately made me think of Human Switchboard for some reason. I really don´t know if they´re the correct answer to that impossible but fun question, but over the years I found that hardly anyone remembers that band, which sure is a shame. 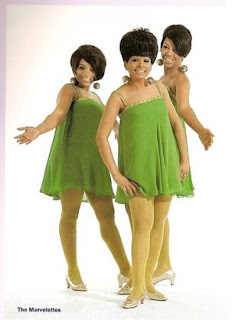 The trio from Kent, Ohio debuted with a nice but ramshackle single, which was produced by David Thomas of Pere Ubu fame. Apart from two live recordings, they only released one official studio album, the great Who´s Landing In My Hangar? from ´81. Listening to it, their Velvets fandom is obvious, but the farfisa organ they´re using throughout makes one think alternately of sixties garage and late seventies new wave (think Costello´s Attractions). 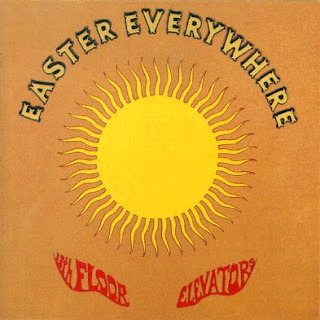 Since Easter is upon us, let´s celebrate some with Roky and his legendary 13th Floor Elevators. Their second album, which I think is even better than their Psychedelic Sounds debut, isn´t called Easter Everywhere for nothing, right? So let´s levitate a bit. "I don't need these wings to guide me, they are hardly ever there... it's the clear I made inside me makes me feel light as air... I´ve got levitation." And as a special egg-hunt bonus, here´s their terrific cover of Dylan´s Baby Blue, from the same album. Enjoyed one of the best games of football I´ve ever seen last night. My beloved FC Barcelona met Bayern Munich in the first leg of the Champions League quarter finals at home in Camp Nou and totally outclassed the opposition. Ninety thousand plus spectators (me among them of course) could hardly believe their eyes as the most lethal forward line in Europe (Messi, Henri and Eto´o) secured a 4-0 win in grand style, which makes next Tuesday´s return more or less a formality. We played many a great match this season already, but this was definitely football from another planet. 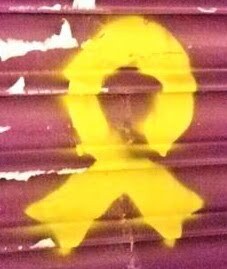 As they say in Catalan: Ser del Barça es, el millor que hi ha... The semis await. To rub it in a bit more, here are some tracks from my fave krautrock ensemble, the mighty Can. Father Cannot Yell stems from the ´69 debut Monster Movie, when Malcolm Mooney was still their vocalist. Nice, but only the beginning. By ´71 the wild Japanese Damo Suzuki took over behind the microphone, and Can really found its form. Tago Mago´s Mushroom shows exactly why Can has a reputation for originality and rhythmic cunning. "I´m gonna keep my distance!" 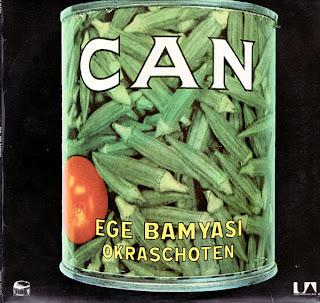 Follow-up Ege Bamyasi (´72), with that beautiful album cover of a can of yummy ladyfingers, is just as good, as the dreamlike Sing Swan Song proves. Next year´s Future Days is probably my favourite Can album though. Ambient avant-la-lettre? Something like that. The hypnotic Dizzy Dizzy from their nearly-as-perfect ´74 effort Soon Over Babaluma finds guitarist Michael Karoli on whispery vocals. "Don´t throw ashtrays at me..."
And as a bonus track, here´s the exotic Persian Love from Can bassist and producer Holger Czukay´s highly original solo album Movies (´79). Auf wiedersehen! ...come back to me. Featuring three very different versions of this wonderful standard, written back in ´28 by Sigmund Romberg and Oscar Hammerstein II for a Broadway show called The New Moon. 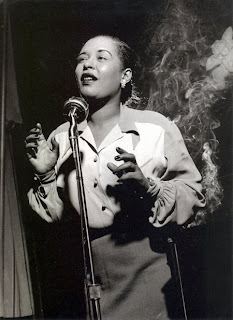 Lady Day sings it like only she can: ´Every road I walk along I walk along with you...´ Big Ben shows he didn´t get called King of the Tenors for nothing, while Trane drops the comma in the title and takes it all to soaring heights. "Get in here captain." Mister Watson´s voice was so low and hard that Henrietta clapped her mouth, her big eyes round. Had that man heard us? As Tant says, mister Ed J. Watson could hear a frog fart in a hurricane. That don´t come so much from hunting as from being hunted. Nice quote, huh? Comes from the novel I´m reading at the moment: Shadow Country, Peter Matthiessens´s latest. Actually a rewrite of his own Watson trilogy, it tells the story of a Florida sugar planter and notorious outlaw at the turn of the twentieth century. Extremely well written, it´s one of these rare books that can easily be added to that small but illustrious list of great American novels. Now I´ve long admired the travel writings of Matthiessen, who´s also well known as a naturalist and environmentalist, and I regularly reread such classics as The Snow Leopard, The Cloud Forest and Under The Mountain Wall. Good thing I finally found out that his fiction is equally good. It may take me a while to finish it though, as Shadow Country´s a 900 page monster.